Threading facial hair removal services are available in Manhattan, New York at the renown Dyanna Spa in Gramercy Park. 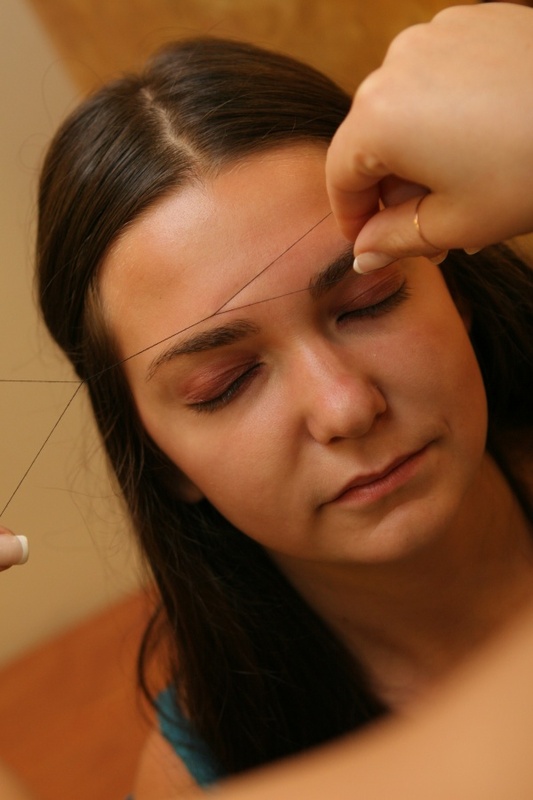 Threading is a process of removing unwanted hair dating back to the early Egyptians during the reign of Cleopatra. It is very popular today in India and the Middle East and it has now found its way to the United States.What is threading? Threading for hair removal uses 100 percent cotton thread. Our specially-trained esthetician twists the thread and rolls it across the area of skin where the hair is to be removed. As it rolls, the thread captures a line of hair, which is then lifted out at the root. Threading can have a very aesthetic effect on the look of your face, revealing the true attractiveness of your eyes and facial skin. Each time you receive a threading treatment, the hair grows back more slowly and more finely, making the time needed between treatments less frequent. Why do people choose threading over other hair removal treatments? One reason for facial threading’s growing popularity over other hair removal treatments is that it is a completely natural. Some people with sensitive skin react to the chemicals in wax treatments, depilatory creams, or in bleaching. It removes hair very precisely and leaves very clean lines. Hair growth is slowed so the time between treatments is longer. Threading doesn’t cause ingrown hairs, bumps, or prolonged redness. It is a suitable treatment for hair removal on all parts of the face. The length of the hair is irrelevant. The process is very hygienic. It’s excellent for people with sensitive skin. It’s safe for people who have had facial plastic surgery or chemical peels. Dyanna Spa in Manhattan has hair threading treatments for the entire face. The treatments are safe, quick, and affordable. Eyebrow threading costs $15.00 for a 15 minute treatment. Chin threading costs $10.00 for a 10 minute treatment. Cheek threading costs $12.00 for a 14 minute treatment. Upper lip threading costs $6.00 for a 5-10 minute treatment. Nose threading costs $10.00 for 10 minute treatment. Whole face threading costs $50.00 for a 20-25 minute treatment. Threading for men is available at a slightly higher charger. If you would like to try the facial threading method, it is very important that you use professionals for the process. It takes a certain amount of skill to ensure that the process is done correctly and that the lines where the hair is removed are smooth and even without hair breakage. In addition, trained estheticians can prevent unnecessary pain, and know in which directly to pull the hair lines. For the best threading hair removal services in New York City, visit our Manhattan day spa where you will receive the best professional hair removal treatments. Our threading services are by appointment only, so please contact us to schedule an appointment.